Do You Have Short, Straight Lashes? Check Out This Super Cool New Lash Curler!!! Meet your eyelashes new best friend. Tweezerman has done it again. At first glance, the Tweezerman Every Lash Curler looks a little like a nail clipper, but they have managed to make a lash curler look cool and updated. Ok, so this curler is not for everyone! If you have long or already curly lashes you may want to pass on this one, but if you have short or straight lashes or you want to create drama on your outer corners then you may want to pick up the Tweezerman Every Lash Curler, $19. I happen to have short straight lashes that definitely need oomph in the drama department.This the tool comes equipped with rounded silicone pads which deliver incredible curl without creasing. Includes three refill pads. But there is a slight catch Tweezerman’s website is getting an overhaul and they aren’t taking orders for a few weeks. Check back after April 9th. 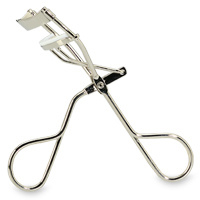 Eyelash curlers: What would I do without them? Behind-the-Scenes Footage of Gwen Stefani’s L’Oreal Shoot! Kate Middleton Will Do Her Own Wedding Makeup!